Maintenance of adaptive genetic variation has long been a goal of management of natural populations, but only recently have genomic tools allowed identification of specific loci associated with fitness-related traits in species of conservation concern. This raises the possibility of managing for genetic variation directly relevant to specific threats, such as those due to climate change or emerging infectious disease. Tasmanian devils (Sarcophilus harrisii) face the threat of a transmissible cancer, devil facial tumor disease (DFTD), that has decimated wild populations and led to intensive management efforts. Recent discoveries from genomic and modeling studies reveal how natural devil populations are responding to DFTD, and can inform management of both captive and wild devil populations. Notably, recent studies have documented genetic variation for disease-related traits and rapid evolution in response to DFTD, as well as potential mechanisms for disease resistance such as immune response and tumor regression in wild devils. Recent models predict dynamic persistence of devils with or without DFTD under a variety of modeling scenarios, although at much lower population densities than before DFTD emerged, contrary to previous predictions of extinction. As a result, current management that focuses on captive breeding and release for maintaining genome-wide genetic diversity or demographic supplementation of populations could have negative consequences. Translocations of captive devils into wild populations evolving with DFTD can cause outbreeding depression and/or increases in the force of infection and thereby the severity of the epidemic, and we argue that these risks outweigh any benefits of demographic supplementation in wild populations. 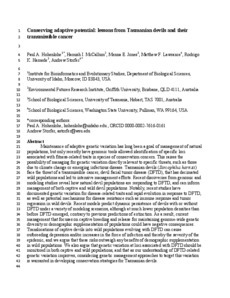 We also argue that genetic variation at loci associated with DFTD should be monitored in both captive and wild populations, and that as our understanding of DFTD-related genetic variation improves, considering genetic management approaches to target this variation is warranted in developing conservation strategies for Tasmanian devils.